Growers, contractors and industry staff heard about cutting edge technology at the dual herbicide sprayer demonstration at the Burdekin Productivity Service’s clean seed plot near Ayr this week. 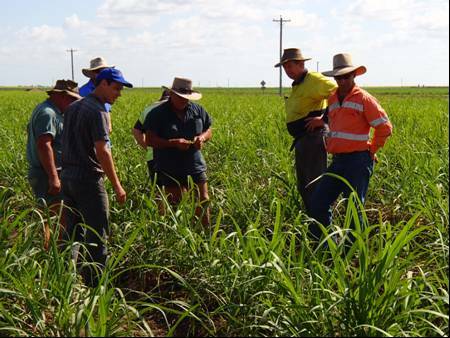 The 21 attendees were in general positive about the results of the initial small demonstration and thought there was enough potential in the technology to warrant more trials and workshops in the Burdekin. The dual herbicide sprayer has been developed by the Queensland Department of Agriculture, Fisheries and Forestry (QDAFF) and has the potential to help growers in controlling weeds while, at the same time, saving money through minimising the use of PSII (diuron, atrazine, etc.) and other residual herbicides. The dual herbicide sprayer replaces the existing spray bar on an ‘Irvin Boom’ and applies recommended cane herbicides (i.e. PSIIs and residuals) through the side or wing nozzles using the sprayers’ existing plumbing. The centre air inclusion, or air induction nozzle applies glyphosate to the inter row. Prototype sprayers have been trialled successfully on farms between Ingham and Cairns however trials are needed specific to Burdekin conditions. Growth measurements and crop yields from trials in northern regions indicated no yield reduction from using less residual herbicides and glyphosate in the furrow. Air induction nozzle technology and details of the cost benefits of the dual herbicide sprayer were also presented to attendees. The Burdekin demonstration was a joint initiative of Burdekin Productivity Services (BPS) and QDAFF. Farmers interested in trialling the cutting edge technology or finding out about future activities are asked to contact Jack Robertson (QDAFF) 4064 1121 or Rob Milla (BPS) 4783 1101.